The University of California Global Health Institute (UCGHI) GloCal Health Fellowship has selected IITA-Cameroon also known as the Congo Basin Institute (CBI), as one of its new training sites in Africa where supportive mentorship, research opportunities, and a collaborative research environment is provided for young and upcoming scientists. Tom Smith, Professor of Evolutionary Biology, UCLA, talks to visitors about bird diversity. With this new development, the CBI joins 28 other outstanding research training sites in 17 low and middle-income countries: Bangladesh, Brazil, Chile, China, Ethiopia, Guatemala, India, Kenya, Mexico, Mozambique, Panama, Peru, Tanzania, Uganda, Ukraine, Zimbabwe, and Vietnam. Its researchers and students will now receive guidance from the 10 campuses of the University of California in their studies. 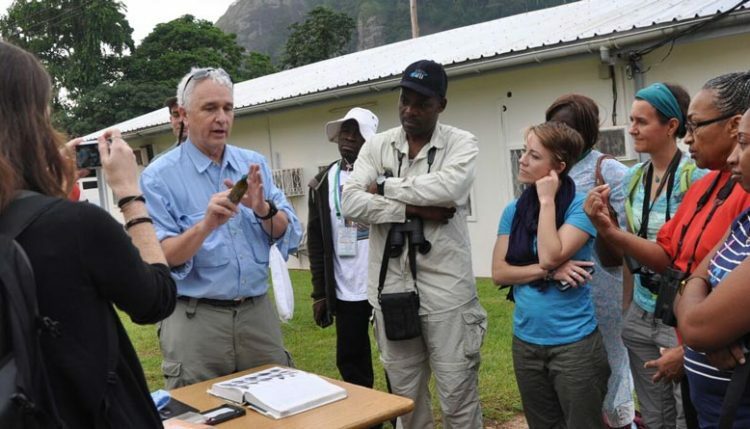 CBI was inaugurated in Yaoundé on 20 June 2015 as a center that promotes biodiversity and provides research facilities for both undergraduate and graduate students to undertake studies for the protection of the ecosystem, biodiversity as well as enhancing the food security status of the African continent. It is headed by IITA senior entomologist Rachid Hanna, who is also the IITA Country Representative for Cameroon. UCGHI GloCal Health Fellowship has also announced 1 December 2016 as the deadline for prospective candidates interested in studying health-related issues to apply to its mentored fellowship in one of its affiliate sites. Read the full announcement here. The Congo Basin Institute was recently featured in a chapter in the online book “Central African Forests Forever” published by Meindert Brouwer, an independent communication consultant, writer, and speaker based in the Netherlands. He specializes in the economic value and benefits of nature conservation and sustainable use of nature. The book can be accessed online at http://www.centralafricanforests.org/about-the-book/ and a pdf version of CBI chapter downloaded at (http://www.centralafricanforests.org/wp-content/uploads/CAFF_10_CBI_Meindert_Brouwer.pdf).